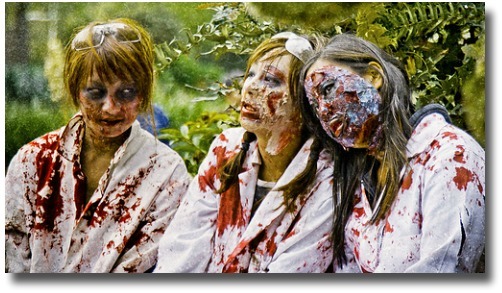 Melbourne City comes ALIVE (well sort of) with the annual and traditional Zombie Shuffle. The annual Walk is fast becoming quite the tourist attraction for locals and visitors to downtown Melbourne, Australia. The Zombie invasion begins at a centrally located point somewhere in the central business district. This is usually announced on the official website and throughout social media channels. 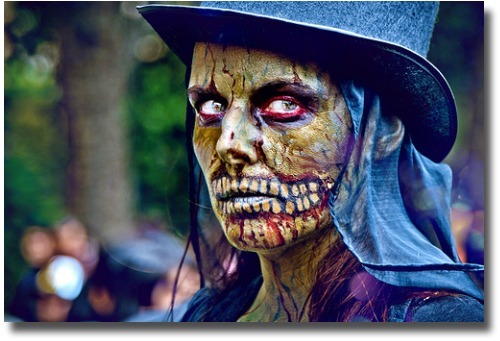 The public dress in their very best or worst zombie costumes and proceed to stagger, shuffle and drag themselves through the city streets scaring as many people as they can. The Walk is open to all ages and sizes, alive or dead. The walk usually last around 2 hours and finishes at the Riverside Skate Rank in the Alexendra Gardens, close to Federation Square. Spectators are encouraged to join in the fun and photos are always welcome. However, please show the courtesy of asking if you may take a photo, particularly of any children who are attending. 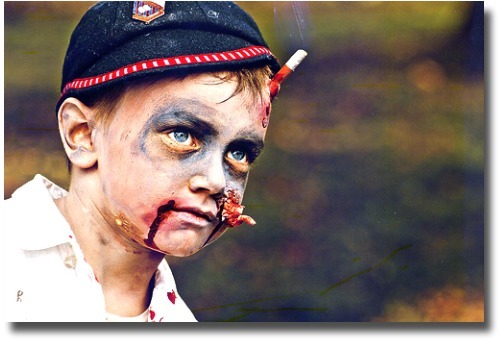 The Theme for the year,2017, was "Disco of the Dead"
Accompanied by grunts, groans, howling and an occasional blood curdling scream, the zombies shuffle along the streets and laneways searching for that allusive brain food. Becoming quite an annnual tourist attraction the procession provides excellent subject matter for the budding photographer to try their skills at capturing the atmosphere. Not only is this special day becoming a tourist attraction but for some families it is fast becomming a tradition that will no doubt be handed down through the generations. Never know, in years to come some of the processions may be accommpanied with real Zombie family members wandering beside their own families! You never know ... might even be happening this very day and age! You'll Love This Scary Tour! Put together by my Travel Tour Affiliate Partner, Viator, these tour are excellent value for money and come highly recommended if you like "the unusual". Don't like to eat brains? Prefer to eat like a Human Being? Nothing like a good relaxing swim after a long Zombie Shuffle!